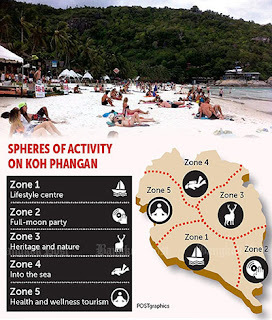 There is a friendly rivalry between the different areas of Koh Phangan. Whether it be east, west, north or south each part of the island has its own distinctive feel and flavour. 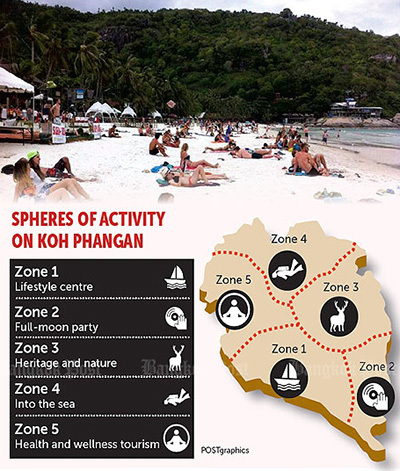 This has been made somewhat official by the designation in 2015 of different zones in Koh Phangan. As you can see from the graphic below it is believed that Haad Rin and half the east coast is for parties, the north is for diving, the west is for wellness and health and the south is for 'lifestyle' things (symbolised by a boat). As with most things emanating from the local government it is ad hoc and purely theoretical. Most of the east coast consists of inaccessible beaches, and other than the weekly Friday night party at Guy's Bar at Haad Yuan there is no party scene on the east coast. Indeed nearly all the parties bar the Full Moon Party and Black Moon Party happen on the south coast, in the supposed lifestyle area. Jungle Experience and the Half Moon Party are clearly not in zone 2 and are clearly allowed to happen. The map is more accurate for the north and west. As Chaloklum in the north is the favoured pier for dive boats. And the beaches clustered around Srithanu have become the favoured spot for gurus and yogis wanting to spread love, peace and happiness (while collecting handsomely for the service). There is something of a clear difference between east and west but not as the map demarcates. On Trip Advisor for best beaches in Koh Phangan Thong Nai Pan Noi is number 1, Thong Nai Pan Yai is number 2, Haad Yuan is number 7 and Haad Sadet is number 9. Clearly the best beaches are on the east coast. The rocky terrain with sheltered bays and the lack of coral reefs make the beaches on this side of the island much better for swimming and sunbathing. The isolation and the comparative lack of development on these beaches also draw true beach lovers. In contrast beaches on the west coast such as Wok Tum, Hin Kong and Srithanu are not great for swimming. The coral reef off-shore makes for big tidal variations. You don't see many people swimming here. Indeed most of the mid-range and luxury resorts have swimming pools as guests are reluctant to walk over lots of slippery rocks to get to the sea. What the west coast does do better is community. There is a growing sense of a common purpose developing as yoga centres, detox centres and vegan restaurants all espouse a common goal of self-transformation. The fragmented nature of the east coast means that people staying in Thong Nai Pan Noi rarely regard Haad Sadet as a possibility for a day trip. Indeed many staying in Thong Nai Pan Noi never even get to the neighbouring beach of Thong Nai Pan Yai. It would need better roads to the east coast beaches to really connect the beaches of the east coast. The airport is on hold, and we can only speculate how the airport might affect the east coast anyway. The good news is that unlike Rudyard Kipling's famous line 'East is east and west is west, and never the twain shall meet'. The two sides of Koh Phangan do meet in Thongsala as this is currently the only hub connecting to the two halves of the island.